The development of new strategies to control pest insects is required, in combination with conventional pesticides or replacing them. Essential oils produced from botanical extracts used in management programs should be effective against pests and selective to natural enemies. Tuta absoluta (Meyrick) (Lepidoptera: Gelechiidae) is one of the most destructive pests of solanaceous crops in the world, and a possible management strategy consists of releases of the predator Nesidiocoris tenuis (Hemiptera: Miridae), along with botanical applications. The objective of this study was to evaluate the effects of Prev-am® oil on T. absoluta offspring, either with or without the predator N. tenuis, as well as the oil’s effects on N. tenuis predatory behavior and longevity. The oil’s effects were compared with distilled water (control) and a synthetic pesticide (lambda-cyhalothrin). The response of populations to lambda-cyhalothrin was similar to that with Prev-am®, compared to the control, showing that N. tenuis had higher capacity to reduce T. absoluta populations. The survival analysis of predators exposed to Prev-am® indicates that none of the concentrations differed significantly from the control. In addition, the canonical variate analysis indicated significant overall differences in the predator behavior submitted to different treatments, suggesting that synthetic pesticide treatment affected predator behavior when compared to control and Prev-am®. 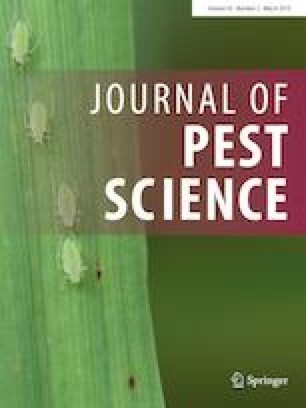 Reduction in predatory voracity of N. tenuis adults exposed to leaves treated with pesticide and biopesticide was significant compared to the control treatment. The results obtained could improve IPM programs against T. absoluta through the Prev-am® applications and N. tenuis releases. A correction to this article is available online at https://doi.org/10.1007/s10340-019-01102-y. The authors thank Philippe Bearez, Edwige Amiens-Desneux and Christiane Metay-Merrien from INRA for technical assistance and the Coordination of Superior Level Staff Improvement (Capes), Minas Gerais State Foundation for Research (FAPEMIG) and CNPq (National Council for Scientific and Technological Development) for provide funding to MAS (Ph.D. fellowship), the project EUCLID (H2020-SFS-2014, grant number: 633999) for funding to ND, and the project STomP (ARIMnet2, grant agreement: 618127) for funding to ND, A-VL, AB and LZ. This article does not contain any studies with human participants or animals (other than insects) performed by any of the authors.